Hi Fi Racks Podium Slimline review | What Hi-Fi? The latest addition to the Hi-Fi Racks Podium family is the Hi-Fi Racks Podium Slimline. 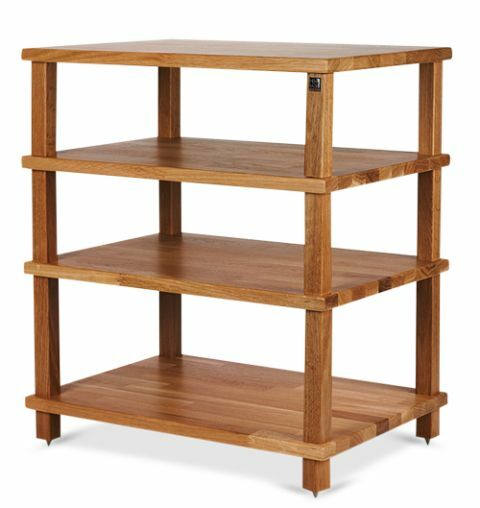 Hoping to follow in the footsteps of previous award-winners, the Hi-Fi Racks Podium Slimline has a few cosmetic changes compared to its siblings. There are thinner legs and platforms, while the Podium Slimline has also lost the isolation spikes found on other models: the legs screw directly into the oak platforms. When placed on the rack, our system gave a full-bodied sound with an open, airy character. Timing and detail could be better from the midrange downwards, but overall it is a relaxed, undemanding listen. We’d recommend really tightening the legs for maximum stability. However, this can leave them askew, which undermines the rack’s neat look. Based purely on how our system sounded, we still prefer the rack's big brother, the Podium. But given the Slimline's smaller price tag and its less imposing stature, there's not much to complain about here.